Dave has worked in the Industry since 1977, starting at Bicyclesport – one of Canada’s legendary bicycle shops. He quickly graduated to designing and building Mariposa custom bicycles – famous for their racing and touring bicycles. While cyclotouring in Australia in 1984, Dave became involved with Brisbane Bike sales and hire and the rest, as they say, is history. 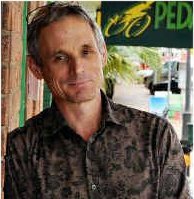 He had the QLD, NT and Northern Rivers Agency for Giant Bicycles from 1996 until 2007 when he made the decision to purchase Pedal Power Plus in Gympie. Pedal Power is now 20 years old.